With the latest version of SCCM 1511, many admins will be tempted to move to latest operating system and SQL versions. Considering Windows Server 2008 R2 and SQL 2008 R2 are already on extended support and the way SCCM 1511 is designed for future upgrades, it can be good time to do a SCCM 1511 migration with the latest OS and SQL. As of now, all system roles of SCCM 1511 are supported on Windows Server 2008 R2, but if you are planning to use Windows 10 Servicing, you must use WSUS 4.0 from Windows Server 2012 and up. 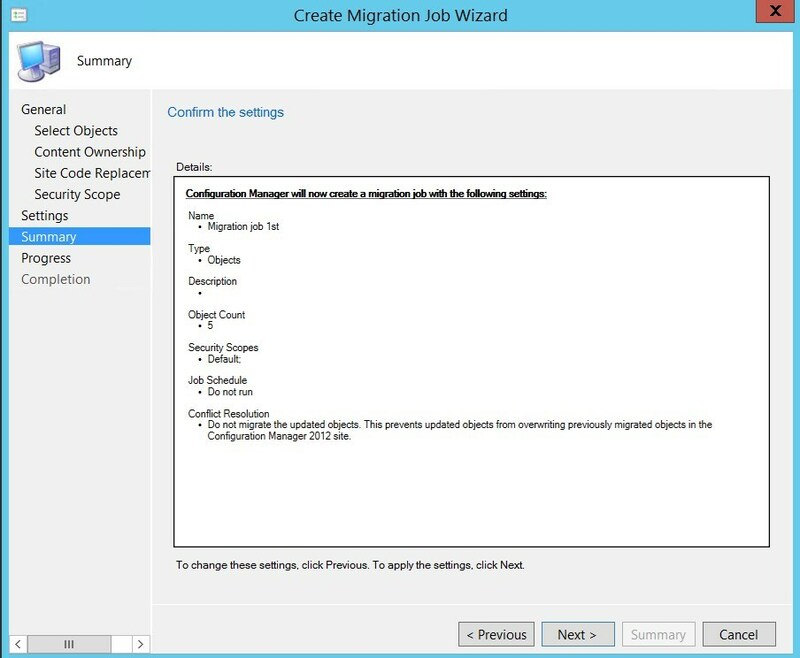 This post will cover the second option, describing SCCM 1511 Migration pre-requisites and tasks. The advantage of this method over the other one (backup/restore) is that it provide minimum down-time. You can do your migration at your desired pace and switch your clients when you’re ready. The disadvantage is that it requires a bit more operational tasks and planning. 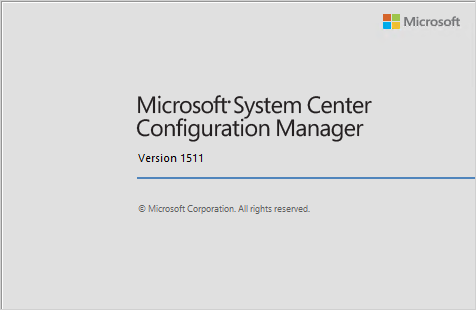 If you’re looking to do an in-place upgrade, please see our SCCM 1511 upgrade guide instead. For more details about pre-requisite, consult the Technet article. 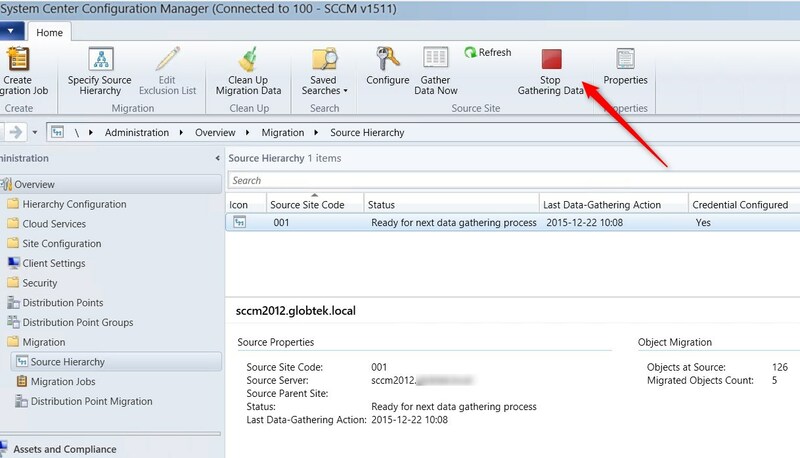 To transfer data between your SCCM 1511 and SCCM 2012 sites, you must first connect them together. Your 2 sites are now connected! 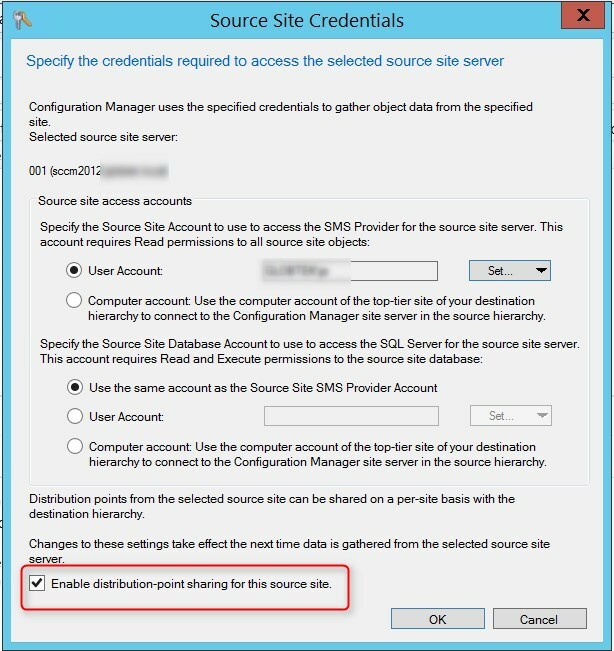 For more details about source hierarchy, read the following Technet article. The Data Gathering process will verify items that can be migrated from the source. No objects are migrated yet ! Data gathering is configured to 4 hours by default. It can be modified in the properties of the source hierarchy. 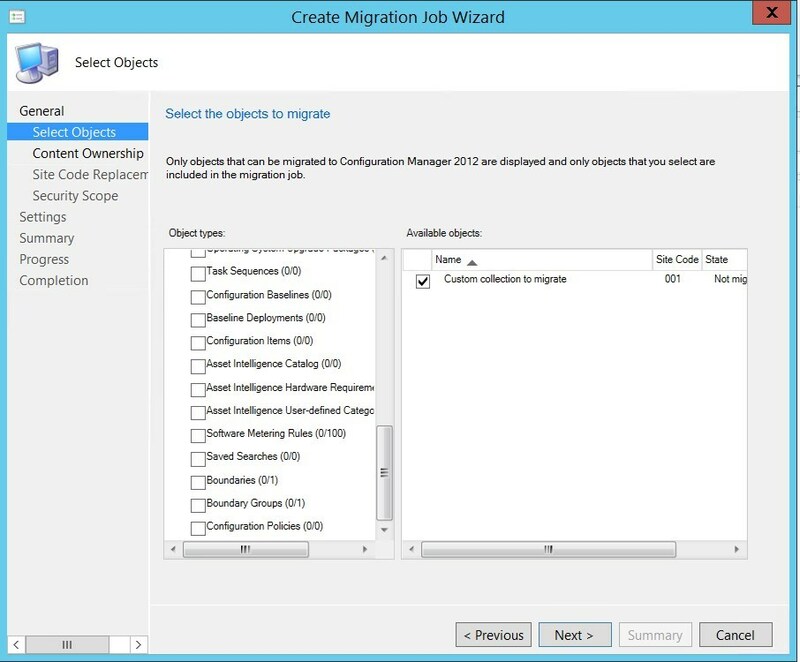 To migrate objects from our SCCM 2012 site, we need to create a migration job. When migrating content from a 2012 hierarchy, all objects should be compatible. Before migrating, we suggest that you read these details about what objects can or can’t be migrated. Once you run the job, you will see objects appearing within the new SCCM. You can run the job at any time by right-clicking the job and selecting Start. Once objects are migrated, you can now migrate Distribution Points. 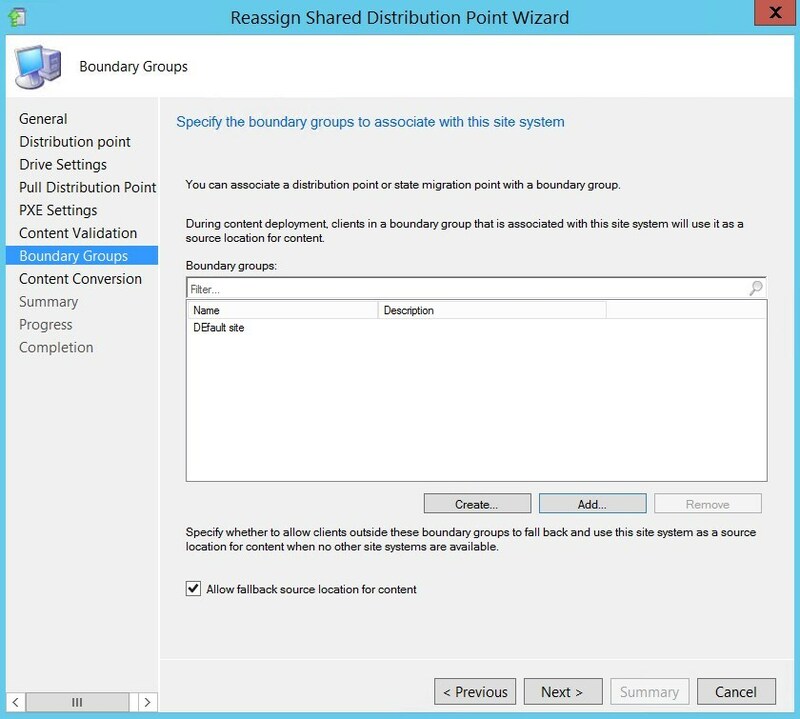 Activating Enable distribution-point sharing for this source site in the Source Site properties will allows previous version Distribution Point to show up in SCCM 1511 and to be used by client as content source when packages are migrated. 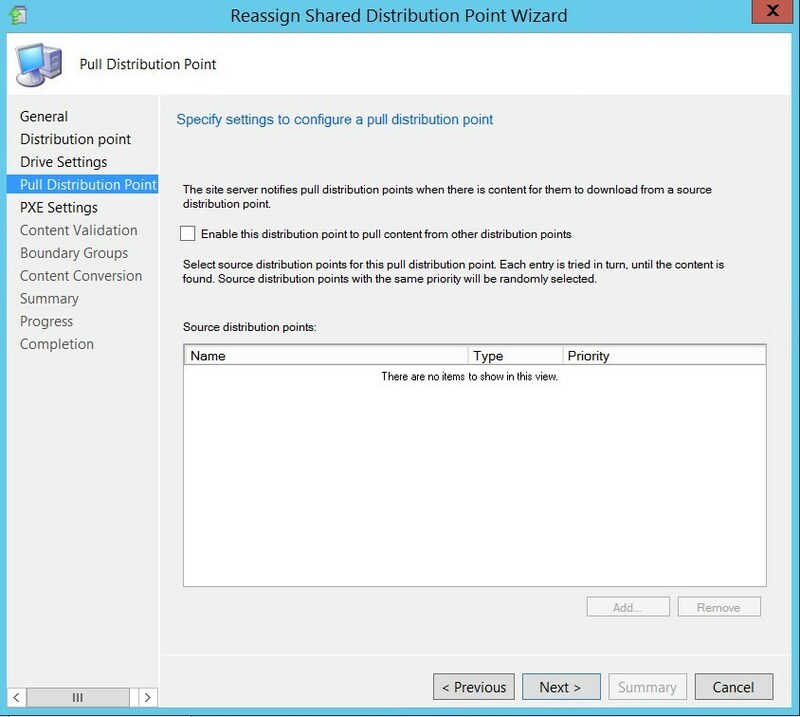 When looking at your Shared Distribution Point tab, you’ll notice an Eligible for reassignment column. 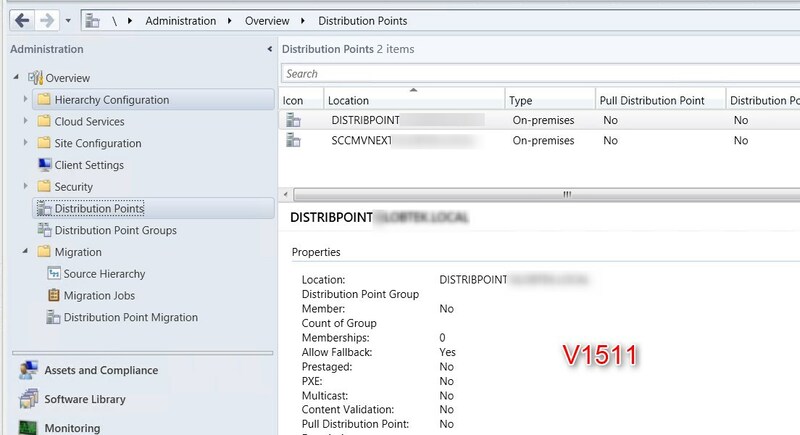 Yes value means that the Distribution Point is ready to be reassign to your SCCM 1511 hierarchy. If you look at a package that has been migrated, you will see that they are already distributed. 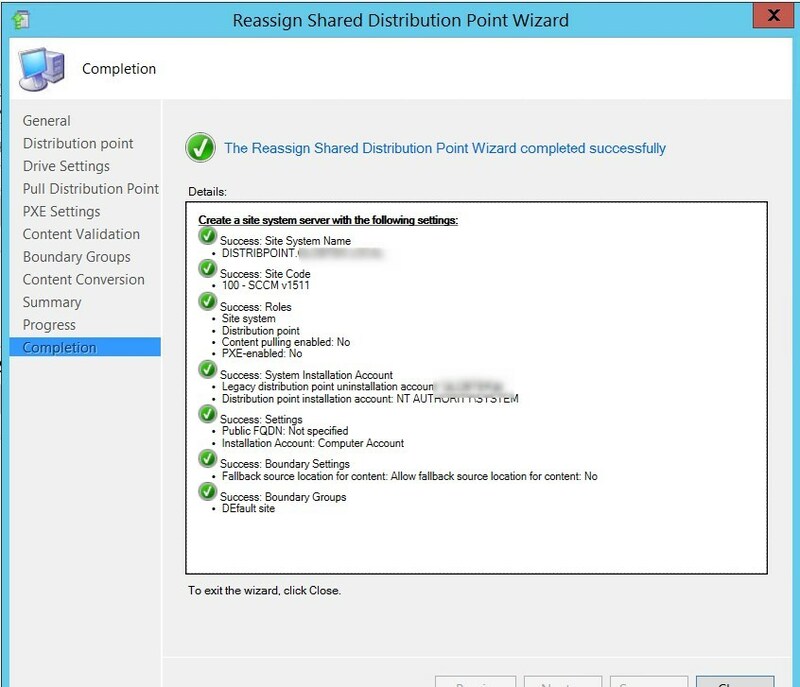 The Reassign wizard is pretty much like a new Distribution Point installation. 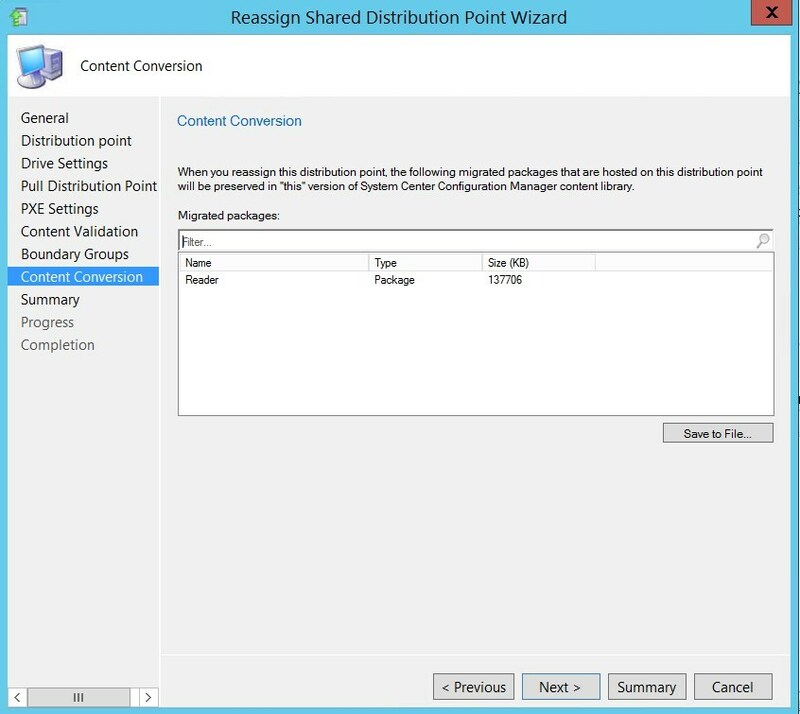 For more details about Content Migration, read the following Technet article. 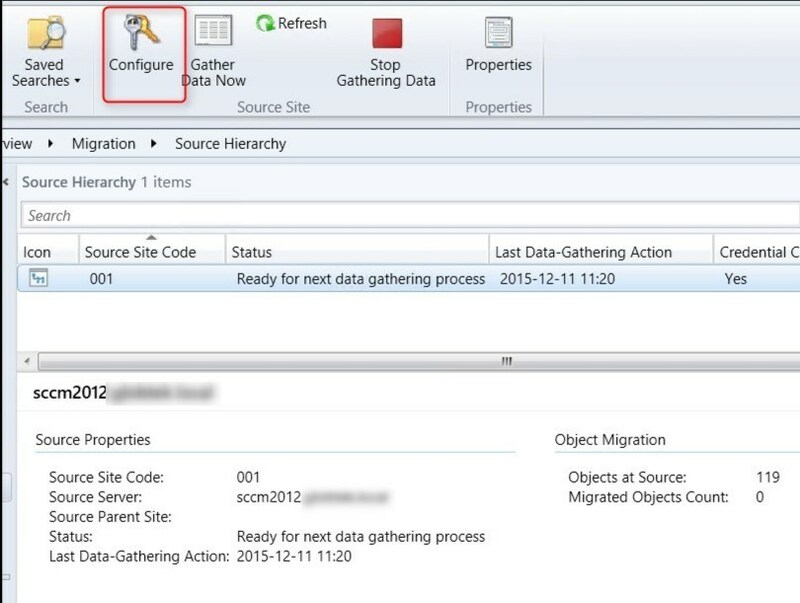 Once all objects are migrated, you need to reassign your client in the new SCCM 1511 site. This script from Steve Thompson [MVP] does the trick! In the end, upgrading the clients uses the same process as any previous Service Pack release. Please refer to our SCCM R2 SP1 upgrade post for client upgrade using auto-upgrade or client push. 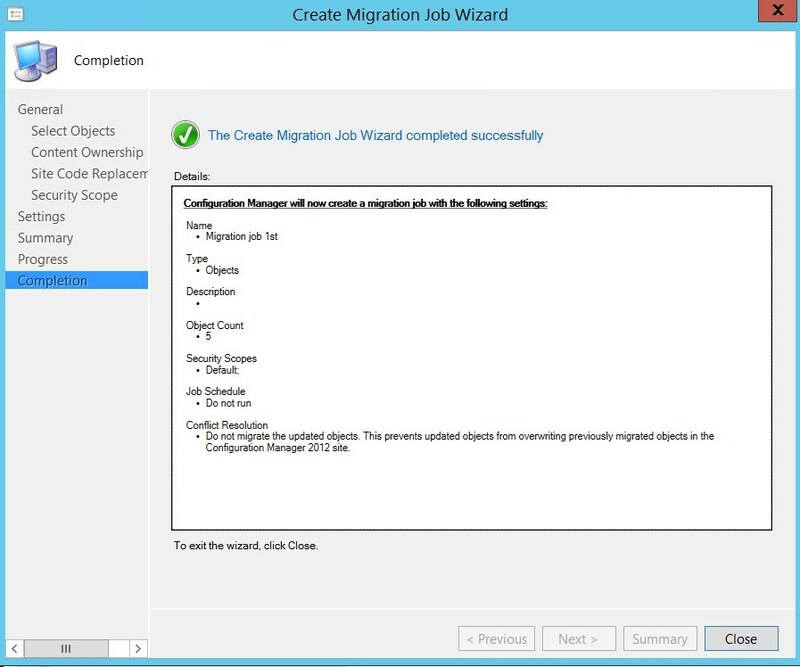 That’s it, you’ve completed your SCCM 2012 to SCCM 1511 Migration. Don’t forget to upgrade to 1602 after your migration (if needed). Feel free to ask your question or leave your comments using the comments section ! Hello, thanks for this this nice guide. Can we apply this on ConfigMgr Current Branch (both old and new server) as well or is there any updated guidelines? Do you have any idea of what it is and how to fix it? Thank you for your post. Great one. When I try to migrate shared DP, gathering information gives me an error: ERROR: [Worker]: Microsoft.ConfigurationManagement.SoftwareLibrary.ObjectSerialization.LibraryException: Couldn’t find the specified instance SMS_SCI_SysResUse.FileType=2. Thanks for taking the time to put this together. It’s very well done. I have a question around shared DPs please. 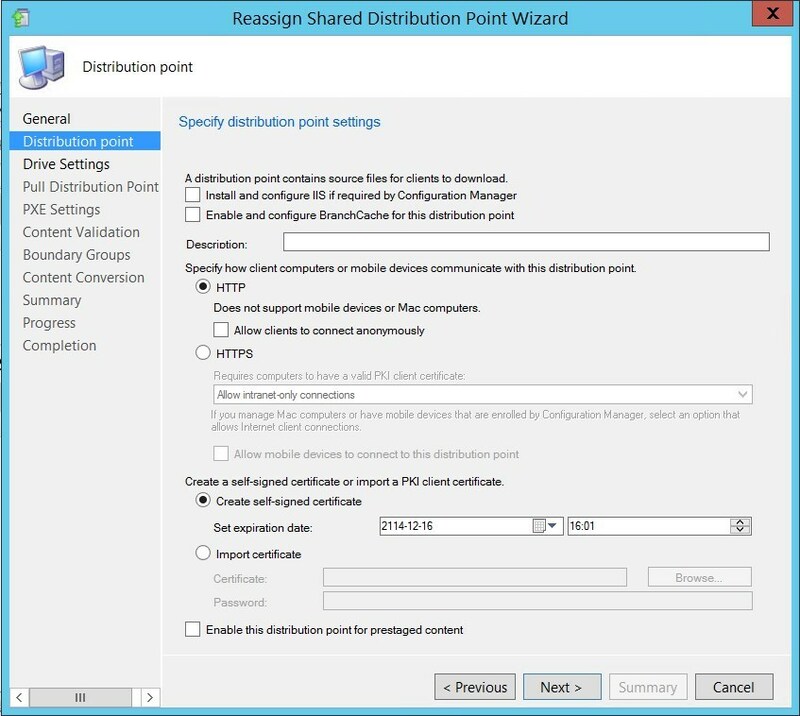 When sharing a distribution point between a 2012 R2 source site and an1806 destination site, which client package resides on the shared DP.? The current 2012 R2 client? When the DP is reassigned does the client package get automatically pushed at that point? Plan to test just looking for a quick answer to begin. Thank you for your work and your help. if I remember correctly, it will be both as the DP respond to request from both hierarchy. On top of that, they do not have the same ID because the site code is not the same. I’ve seen issues with Client Upgrade package while the DP is shared. Once reassigned, and after an SCCM upgrade(update rollup or major build) the issue was fixed. Do you have any suggestion for post-migration jobs? For how long we can still use the old SCCM Infra and how to clean up once migration is completed? Thank you for the detailed article. Good job. try to move away from the old infra as quickly as possible. Maintaining 2 SCCM infra is time-consuming and is likely to lead to all kinds of error. Hello, great post. I am following your guide and It is well written. Question: When I run a migration job, on the Content Ownership tab both source and destination appear blank for me. Is that a sql? or configuration issue? I was able to specify source hierarchy and gather the data. I would presume that you are hitting some kind of display bug if it works. Feel free to open a support case, but as you said, it’s working, so I wouldn’t mind too much about this I think. Can i follow the same Step2 for Migration from SCCM 2012 R2 SP1 to SCCM 1802 Baseline media? Thank you Jonathan, Nice work! We have 2 SCCM environments in 2 AD forests with two way trust in place and we are planning to move all clients and objects from forest 2 to forest 1. Forest 1 already has objects and clients. Can I assume that guide will still be applicable and migration will add new objects without interacting with existing objects? Anything that we should be careful of in this scenario? 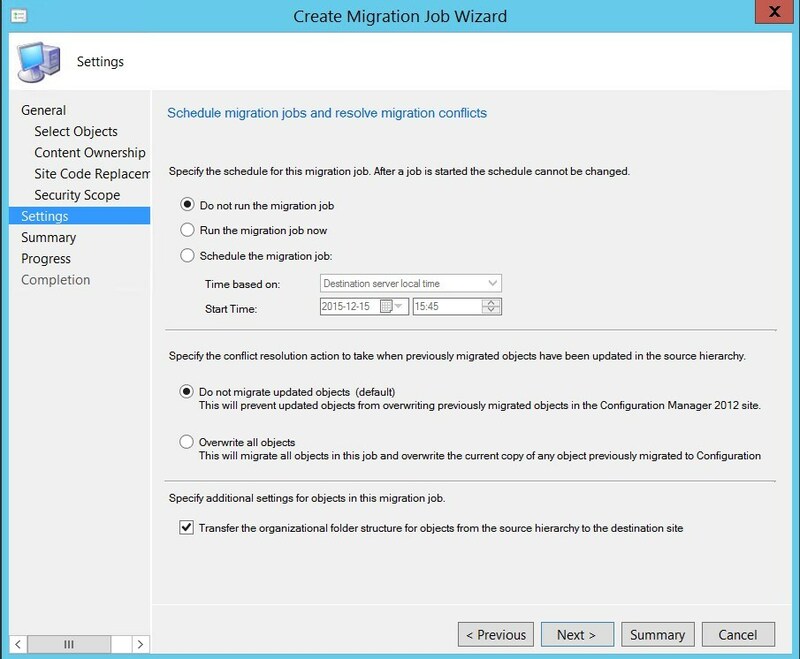 Hi i have ran a side by side migration, from SCCM 2012 to 1710, everything has gone well, apart from when trying to migrate some items using the Migration wizard, the status of the migration job is at “Available to Migrate” how do i get this item to actually migrate successfully instead of just showing available to migrate? All of the pre reqs for this item have migrated successfully and these are all skipped, when running the job again. can you give a bit more detail? what kind of object is causing issue? 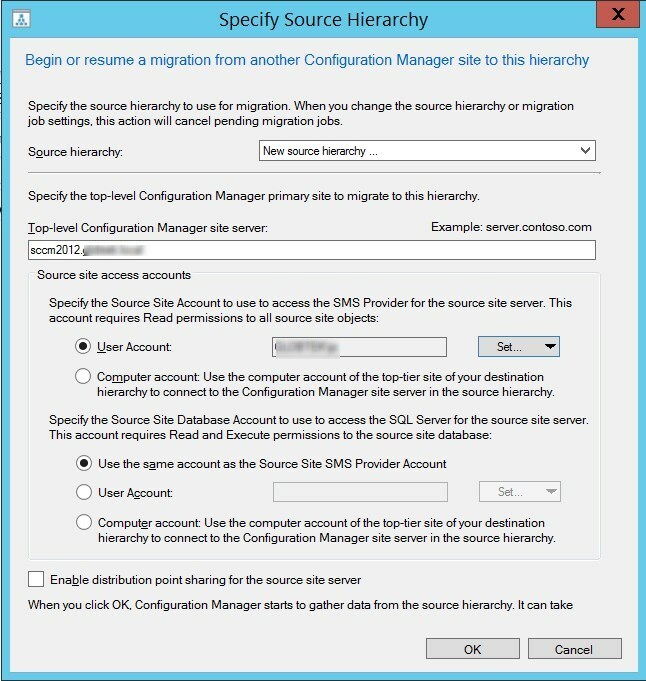 where can I find more information on post migration steps specifically decommissioning of source hierarchy and removal off old SCCM site servers? After the migration is complete and you want to test just a small group with upgrading the client do the machines with the 2012 client still communicate with the current branch until they are upgraded? clients needed to be reassigned to the new Site. Once this is done, you can upgrade the client in small batch without issue. The steps were detailed, no problem with your article dude. It was dope you put a lot of work in it. But I personally prefer using GS Richcopy 360 to do file server migrations. It has helped me a lot in the past and now also. Maybe you should also use it and probably write an article on it too. Great guide, one question. If I have a 2012 server and have already run the schema update for this, do you need run the schema update for the 1511 installation as well? Does it include additional changes? If it does will this affect my current 2012 installation until you migrate from it? No need to run the Schema update again. It hasn’t changed. 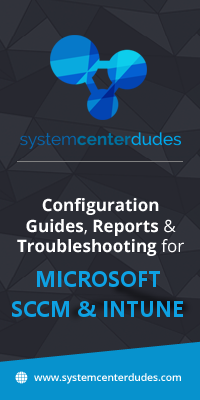 im quite new to installing and migrating SCCM so im learning along the way and have i have a couple of questions about this guide. can i use this guide to migrate our current 1610 install of sccm running on server 2012 to..
install 1702 on server 2012R2 ? our SQL server 2008R2SP2 is also unsupported for 1702. I have been working with our DB admin to move/copy the DB to a new supported SQL version. is this the best guide for what i need or is there another guide i should use? We currently are running ConfigMgr CB 1606 on a Windows Server 2008 R2. Planning is in-progress for a Backup/Restore to Windows Server 2016 OS and we have been informed by Microsoft that changing the Primary Site Server name (FQDN) is not supported. After reading this blog, I wanted to know if giving a new Primary Site Server name to the Windows Server 2016 VM is possible while performing the migration jobs. What are the steps involved? We have 1 Primary Server with co-located SQL 2012 & 4 PXE Enabled DPs & 1 SUP. Yes migration allow you for a new server name. It’s actually mandatory, as the old SCCM will be up and running, at the same time as the new SCCM server. Therefore, a new name is required. For option 1, can the restore be on a different OS? I am moving from server 2012 to server 2012 r2. i am keeping the same name and IP. Is there a way, or such a script, that I can run to change the content location for all of my migrated applications, etc.? 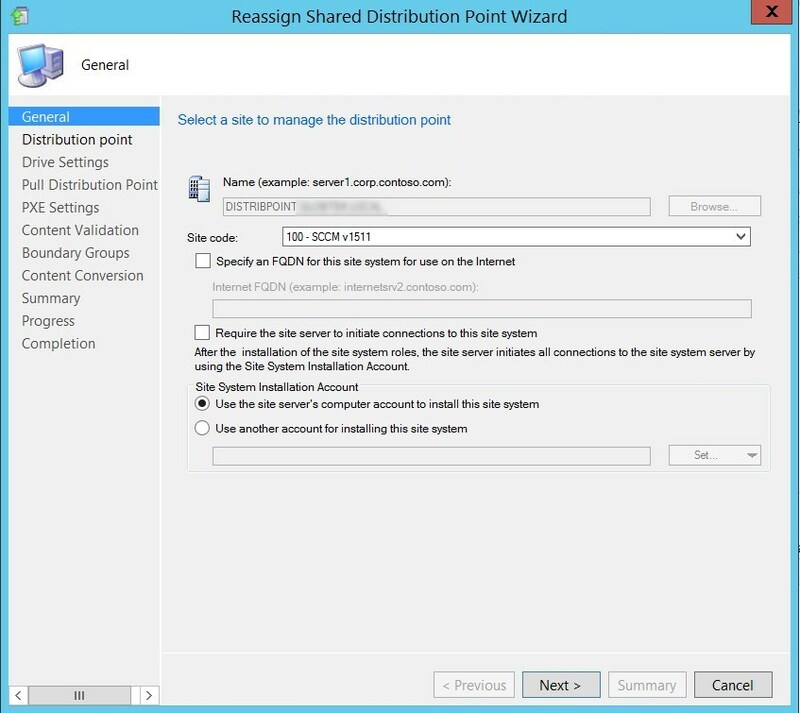 In our environment, we only have a single stand-alone SCCM Site Server/Distribution Point so I cannot perform a reassignment of my DP as it does not meet the requirements. What else can I do? There are other out there also. It might be related to Boundary configuration? Look at the DataTransferService.log and ContentTransferManager.log to see where the client is trying to download the content from. Hi. I have a windows server 2008 R2 with SCCM 1610 and SQL Server 2012 Environment. There is a named instance created with database name matching SCCM Site code. Windows server 2008 doesn’t support 1702 update, so organization is planning to build a new sccm 1702 on windows server 2012 and sql server 2012. I liked this side by side migration and think its possible here. But while creating new database in new server I have to create a database name which matches new site code. Can I migrate objects from old to new server with 2 different database names. The database itself as nothing to do with the migration. Everything is done within the console, so yes you can migrate object with different database name. Database name is named after the Site code. As stated, the new server must use a new Site Code, therefore a new database name. Suggestion, try to used at least Windows Server 2012 R2 and maybe a more recent SQL than 2012. Fantastic post. Is it possible to migrate the software update groups used to distribute Microsoft Updates? Yes you can, but I don’t like to do that. Most of the time, reviewing/reconfiguring the Patch management process is done along with a migration. This give a cleanup on the Software Update packages, and ADR will take care of creating new SUG when needed. We are going from SCCM 2012 R2 SP1 to a new site server running 1702. Our storage point is a LUN on the 2012 box, with the a new LUN created on the 1702. Both LUN are mapped to the same drive letter. Instead of reassigning the DP, which is hosted on the 2012 site server, can I clone the contents of LUN on 2012 site server to LUN on 1702 site server? 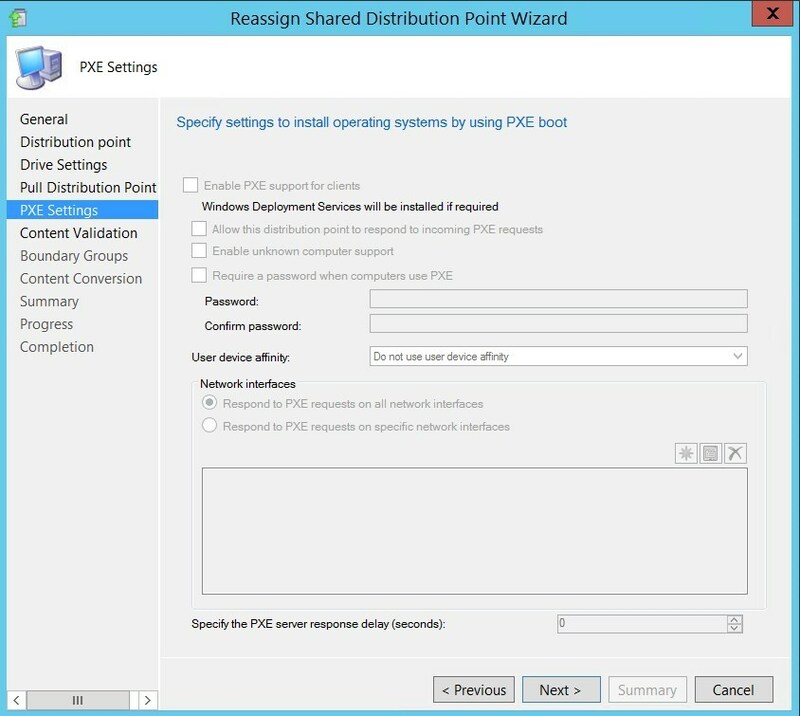 Then do a migration, followed by a configuration of the parameters for the DP on the 1702 site server? I am really finding out that the whole Migration Tool is really lacking in a lot of areas. All of my package programs that are set to only install on a certain OS no longer have the OS check box checked. I have also found issues with Task Sequences that were copied over with the software install step. I had to recreate several programs just to get them to show up to add to the TS. MS makes it look and sound so easy but it is far from it. They could really do quite a bit to make it so much better. So I am migrating from 2012 to a new server with 1702 and am running Migration Job. Is there any easy way to change the package source on packages,drivers, wims, etc. other than touching each and every one of them? there are couple script/tool to help with that out there. The coretech tool or script should still work just fine. Cool thank you! I tried the Coretech tool and it crashed on Server 2016 :(. I’m going to try the migration from a physical Server 2008 R2 x64 system running SCCM 1606 to a VM Server 2016 running SCCM 1702. For the migration, would you migrate 1606 to 1606 and then upgrade to 1702 or would you upgrade the new VM to 1702 first, then migrate from 1606 to 1702? I’m assuming the later (1606 to 1702). Thanks and great guide. Very helpful. 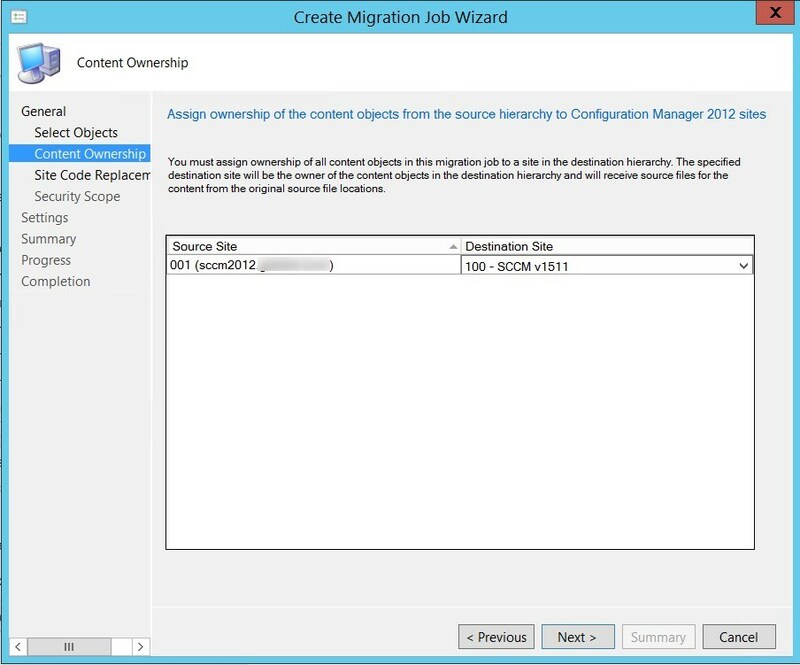 I would have the destination SCCM to 1702 and migrate content from 1606. They don’t need to match SCCM version for migration. I’m trying to do a migration from 2007 to 1511. I have my new CAS and Primary setup. When I specify the source hierarchy, do I need to use the 2007 CAS or can I use primary? I got my answer. No, I can only specify CAS. Thanks for the Guide just wondering on the distribution point migration 38 of our 59 DP’s have a PXE role installed is this classed as a site role ? or will I be able to convert it over to 1511 with no issue ? It will take care of this automatically when you reassign the Distribution Point. 1. We have a SQL cluster and cannot install SQL Locally on the SCCM Server, licensing is what I was told, this in turn is giving me fits when trying to add Reporting Services. I have read to install the SRS to the SCCM SQL server? I was going to go ahead and do that but I noticed that it defaults to the DB for SCCM instead of the ReportServer I created for SRS? Any Ideas on how I should move forward? I am in the admin Group on both servers and the SQL servers as well. Any ideas would be much appreciated. For the SQL, you should double check about licensing. For what we know, SCCM comes with an SQL licence rights for SQL Standard, that as ONLY SCCM using it. Therefore, installing SQL on the SCCM is supported and legal. I can’t find the updated link, but here’s a hint about that. Not sure to understand the SSRS issue you have. I would recommend get over with the Migration and stop gathering data. The longer you keep both infra up, the more issue you will run into. We are looking at moving from a 2008 server with 2012 sp1 sccm on it, to a 2012r2 and latest version of sccm for windows 10 and mac deployment. The guide is going to be so helpful but one question before I start to look at it. The current database is on our separate SQL server. Is it possible to keep the SQL database we are currently using or will i need to set up a new database on the server and then retire that to. You can’t use the same database. A new one will be created when you install the new server. You should be using new SQL instance if you want to use the same SQL server, for the new SCCM. Question? I am doing a side-by-Side Migration from 2012 r2 to 1606 updated to 1610 (new hardware and OS) and am wondering if there is any particular order to the madness of Migrating the Objects. We are very happy with our current environment and pretty much just want to migrate old to new. I am wondering if I should create a job for each item, meaning one for Software Distribution Packages, Software Distribution Deployments, Task Sequence Deployments, etc, I’m sure you get the reference, or can I create a job for all the objects and migrate at the same time, then update as needed with individual jobs? 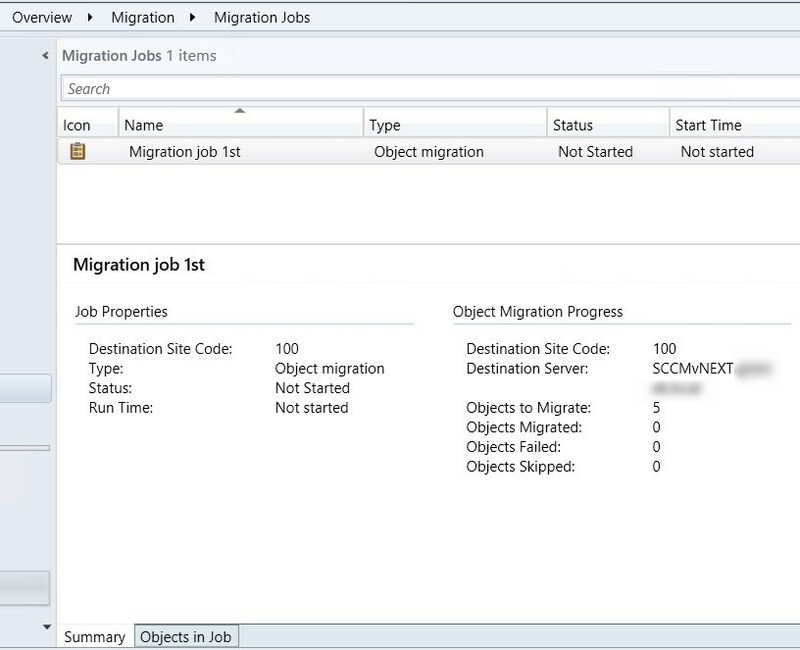 The reason I ask is I created a handful of migration jobs and noticed a lot of the same things being associated with the other migration jobs created(Mostly collection association).. Just trying to cut down the migration bloat with ongoing updating of objects that may change until the final cutover to Current Branch. Normally I have 3 migration tasks. 3nd for all items modified/New after the 2nd migration job as ran. Something you might want to include before you start the Migration Job section, give the new server name local Admin Rights on your old server. 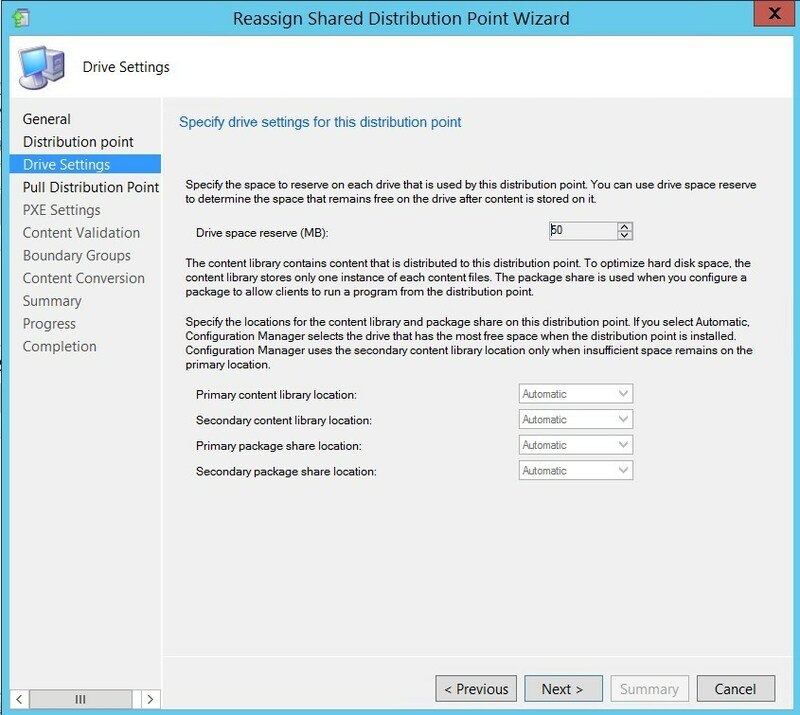 I was constantly getting “ConfigMGR Provider is missing read,Write or delete privilege for the driver package.” I was stuck with 70 drivers/packages that would not migrate until this was done. Edit: Well that actually got 58 of those items, now i have task sequences, Sequence deployments, and os deployment images that will not migrate, Error: This object was skipped because an object it depends on failed to migrate……… Wow So much fun. I’m about to migrate Side-by-Side SCCM 2012 R2 SP1 to SCCM 1606. During the installation of 1606 when I come to the “Primary Site Installation” shall I join an existing hierarchy or install as a “stand-alone site”? And shall I install additional Management Points and Distribution Points? When you do a side-by-side migration, both SCCM will be independant. So do the installation as Stand-alone site. Yes the new SCCM 1606 will require a Management point. 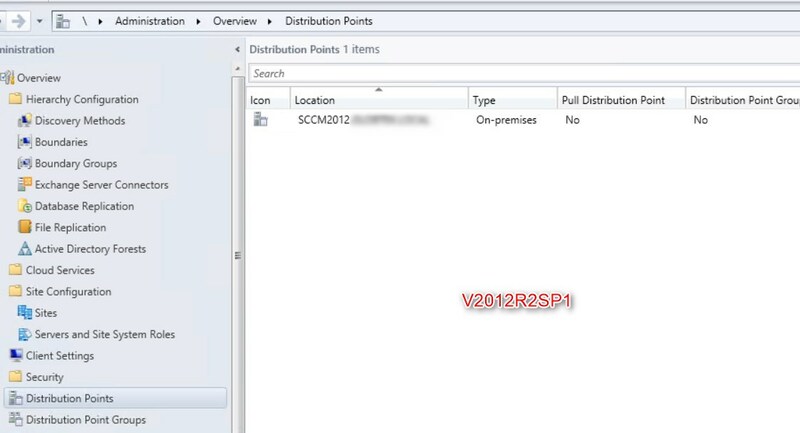 For the distribution point, you could migrate the one from the SCCM 2012 if it is not hosted on the primary site. 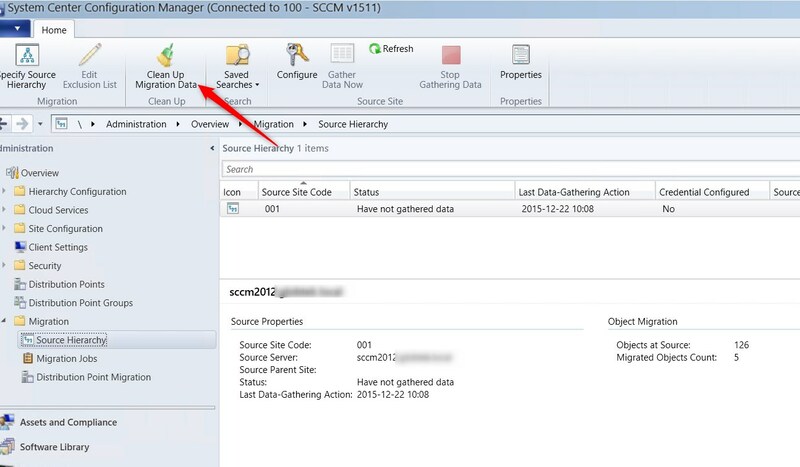 If it is hosted on the primary site, you will need a new distribution point for SCCM 1606. Can I assume I can use this guide to perform a migration to 1606? Great post! When doing a migration from SCCM 2012 R2 to 1511 on to new hardware does the hierarchy have to be the same on both sites? For example can you migrate from an SCCM 2012 R2 environment that has a CAS and 2 Primary sites to a new 1511 environment with only 1 primary site? No CAS? no need to have the same hierarchy on both sites. 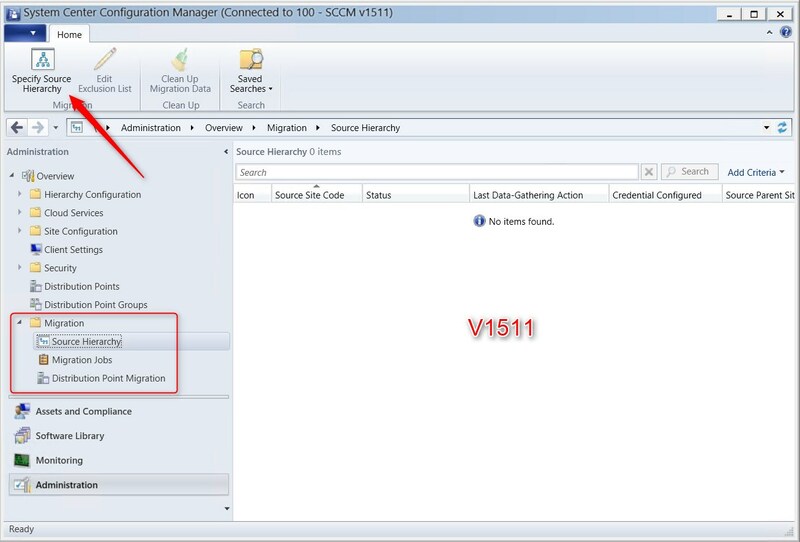 Very helpful article, I am trying to migrate from SCCM 2012 to SCCM 1606. SCCM 1606 is on new hardware and local SQL. SCCM 2012 has remote SQL with port 5191. During “Specify Source Hierarchy”, how can I enter old sql server name with port? as specified in the wizard, you need to specify the Top-Level ConfigMgr primary site. This mean the primary server, no matter if SQL is local or remote. It is not needed to specify the SQL server at any point. 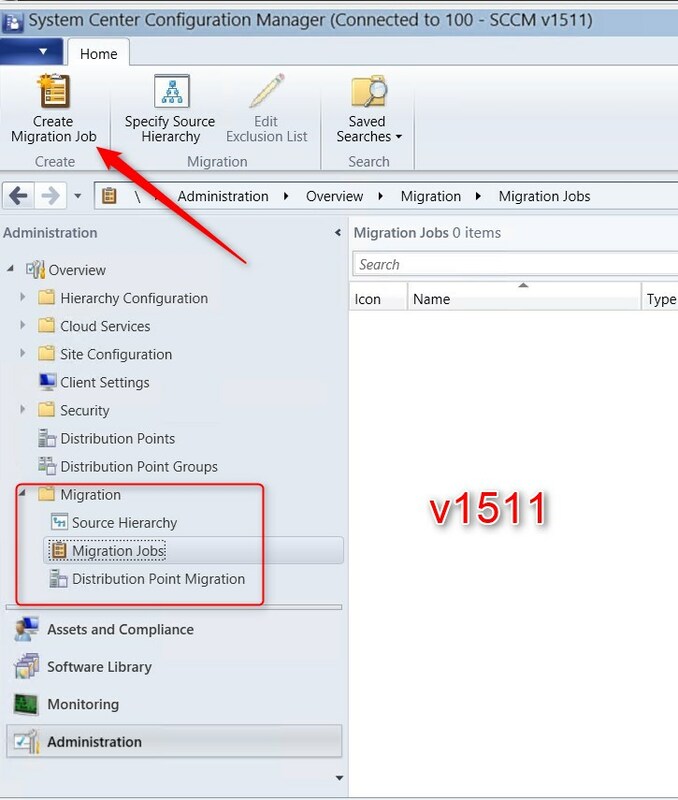 I have setup migration from SCCM 2012 R2 to SCCM 1606. Account I am using for the migration job is a full admin on both environments. The data gather and migration job complete successfully. The problem is it is not finding all objects. Of the 400 objects in the source hierarchy, the data gather is only finding 195 objects. Specifically it is not finding majority of my clients from the source hierarchy, only 86 our of a possible 386. P.S. Thanks for the work you guys do, been using your guides for a long time. clients cannot be migrated with a migration job. That was going to be my backup plan anyways. Good deal then, that is easy enough. All my Distribution Points are gone after upgrade to 1511! I am going to migrate from a old 1602 to a new 1511 server that I just created. Is that possible or do I need to upgrade the new 1511 to 1602 first? If so, can I upgrade it to 1606 before the migration also? I’d go minimally to the same version as the previous architecture. So if you use 1602, be sure the new infra is at least 1602. You could also be up to date with 1606. Application – Provider exception: Can not import same app more than once. Application Deployment – This objection was skipped because an object it depends on failed to migrate. I was under the impression that overwrite meant it should migrate the application again. Is that not the case? Do I need to install all SCCM roles as source? Half of my objects are failed to migrate with the message, “This object was skipped because an object it depends on failed to migrate.” What does it mean? How can I resolve it? This is great article. I have an question. In a scenario where DP is hosting other site system roles (State migration point), as per MS, the DP cannot be reassigned to new hierarchy. So does that mean it cannot be shared as well. Can we share DP with other site system roles, and then add additional new DP server on new hierarchy in same subnet, pull content from source DP that is shared and then remove old DP. that way we can pull content from existing DP in a local LAN connection rather than pulling from remote primary. Any thoughts or suggestions?. Old DP’s are running Win server 2003. That is one of the reason for considering a new local server with server 2012. Don’t think doing an OS in-place upgrade from 2003 to 2012 on SCCM DP would be a good idea. I presume that you would prefere to sync locally the content instead of on the WAN to a primary site. Bit complicated, but sure shot. Thanks Jonathan. after thinking trough, i came up with exact same approach as outlined here. I am following your option 2 and bought the full documentation as well. I am preparing a server for SCCM 1511 and following your full guide. Do I need to configure SQL as you have mentioned or all the settings will be migrated from the source hierarchy? Please advise, as necessary. Currently, I am stuck at this point and looking forward your reply. I’m not sure if I understand your question correctly. Are you wondering if you need to install an SQL on the new server for SCCM1511? If so, yes, SQL must be installed prior to install SCCM 1511 on a new server. The migration is only for SCCM stuff. SQL is independent of that process. Thanks for the reply. Yes, I did install SQL on the new server. Now, how can I migrate SQL stuff because without SQL, there is no point to migrate SCCM alone? I don’t know what you could migrate for SQL stuff. 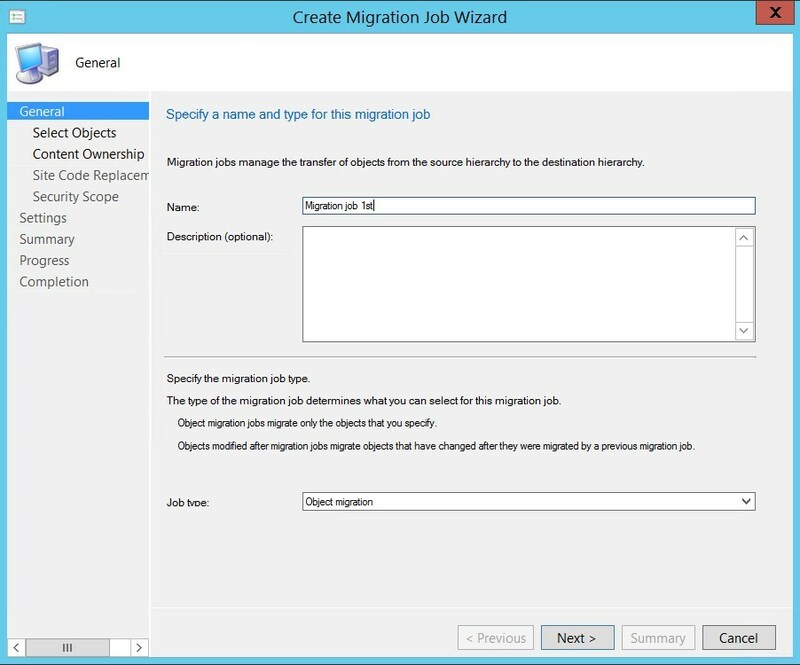 All the migration task for SCCM actually happen in SCCM. So, when migration task happens, it populates the SQL DBs too? What if I have mapped SAN LUNs to SCCM server. For example, SQL Data, SQL Backup, WSUS, and Application Binaries. Should I do anything different while following option 2? I don’t see anything different if you use LUNs on your previous installation. I presume that the sources for application/packages/etc. are hosted on a mapped LUNs. If so, you might have to reassign that LUN to the new server so your packages still have a working source. The other option is to move the content to a new LUN, that you would assign the same path as the previous server. That would prevent you from modifying all sources path. Best pratice is always to use UNC path for sources. That cleans out that kind of issue. Very nice article, We wanted to migrate our environment with the current setup as below. SQL Server Standard 2008 to SQL Server 2014. We wanted to perform migration of current infra by side by side method. We have 1Primary and 26 DPs at different locations to be migrated. How to manage boundaries, Migrating Packages, Reports and Shared Distribution Points? Any detailed documentation available, Please share with me and Help me in this regard. We are on SCCM 2012 R2 Sp1 CU2 (DB on SQL 2012 SP3) and looking to upgrade the infrastructure to 1602. Can we directly migrate to 1602 from 2012 R2 SP1 or do we need to upgrade to 1511 first and then to 1602? Yes, you need to upgrade to 1511 before going to 1602. 1602 is only available from the Update and servicing feature in 1511. I’ve a short question. In 2012R2 we’ve structured the Software Updates into folders. Is there any way to migrate them to 1511? I have question on side by side migration from SQL DB perspective. We have our source hierarchy on SCCM 2012 R2 Sp1 CU2 with SQL 2012 SP3. 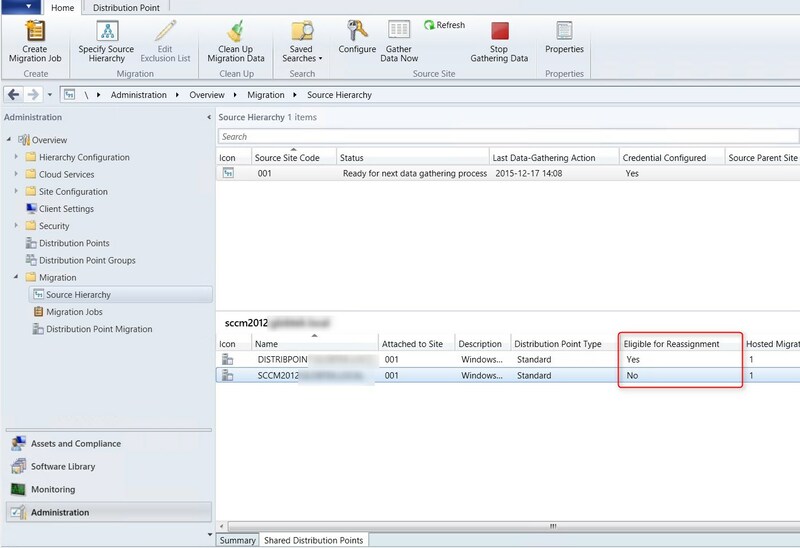 Is side by side migration supported to SQL 2014 SP1? I migrated SCCM 2012 R2 SP1 running on SQL 2008 SP1 to SCCM 1511 running on SQL 2014 SP1. However, I didn’t migrate everything. For example, I migrated drivers, driver packages, applications, task sequences but opted to re-create all my software update settings to take advantage of the new multiple deployment of ADRs on 1511. Everything else migrated fine. The advantage for me of migrating was that I could have both the old and new servers running at the same time and use the old one as a reference when re-creating stuff on the new one. Once I was happy, I used a startup script to update clients and point them to the new server. with this method, Can I retain user history information, like Hardware Inventory or anything else? All different inventory will NOT be migrated. It will be back after regular cycle when the client reports to the new server. If you had custom WMI class as part of your Hardware inventory, you will need to re-import them manually to the new server. The only “inventory” that follow is the history of deployment on a client, which is held locally on each client. This will prevent re-running past advertisement. Great Article as always! I do have a question, and I apologize if this is because I am not understanding this correctly. In our environment we have two servers, both running 2008 R2, 1 SQL and 1 for MP/DP. 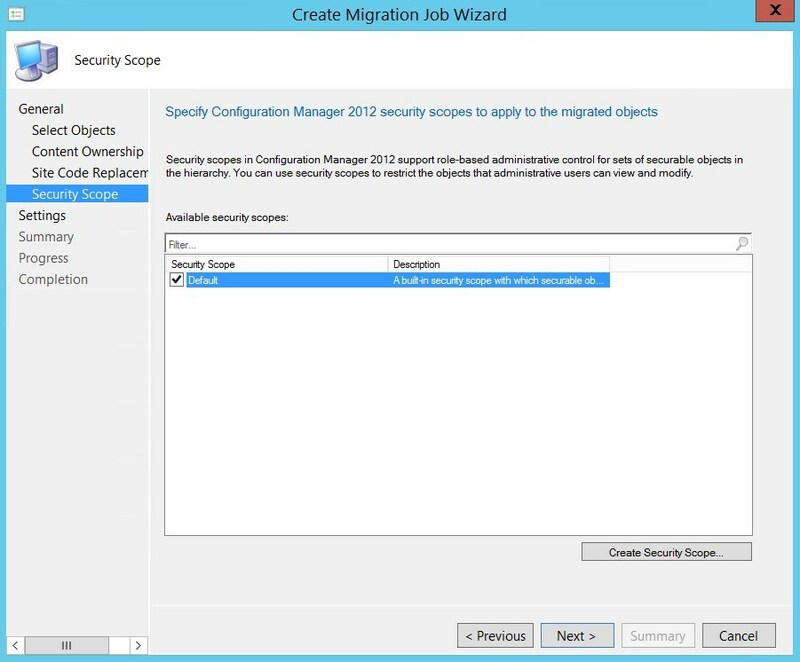 We previously followed your upgrade procedures, migrating from SCCM 2012 R2 CU4 -> SCCM 2012 R2 SP1 -> 1511. These were fantastic and very easy to follow. We now are wanting to upgrade our Operating System on both of our servers to Windows 2012 R2. How would that be best accomplished? I thought this was going to be explained in the article, however I was incorrect as we had already upgraded our SCCM version. Any and all help is greatly appreciated. Thank you. Anyone get an answer to the Intune Question? Thank you very much for this great guide. All my objects are migrated to new 1511-Site and all agents are nearly deployed. My last question is about my currently running Intune Subscription in the 2012 R2 SP1 source site. What is the easiest way to get that subscription up and running on my new 1511 Site ? Do i have to create a new one – or is there a way get the existing one moved/pointed to new Site ? I pulled the trigger on the Intune Migration. Here’s what I had to do. A few notes. We are 100% iOS and we do not currently use Apple DEP or VPP. So your mileage may vary. 2. Add the Intune Connection to the 1511 (1602 in my case) Site. Configure Branding, etc. 5. 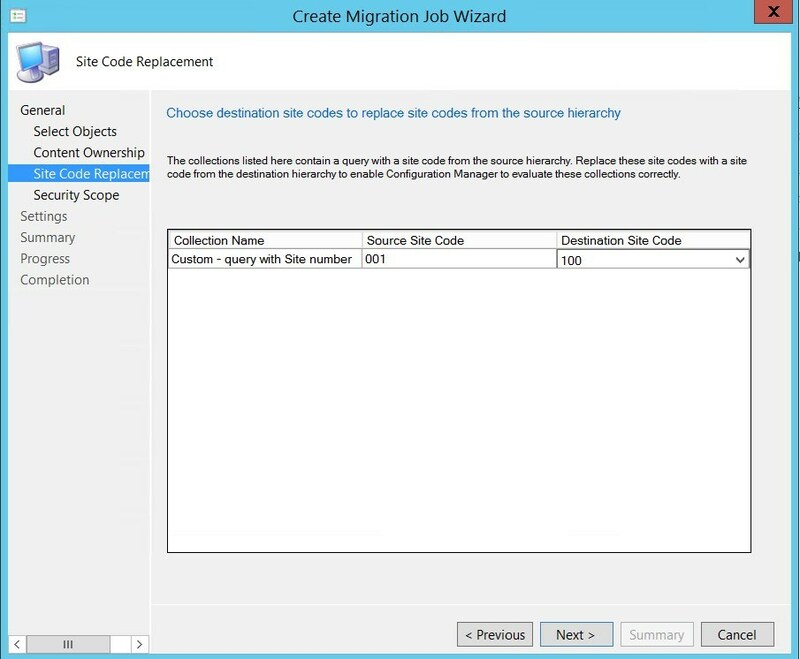 Migrate or Recreate Applications, Collections, and Policies from 2012 R2 SP1 Site to 1511 Site. 7. Re-register their Device in the Company Portal. Devices appear in the new site. Fortunately we were still in our piloting phase so I didn’t have a terribly large number of phones to re-register. I just delayed our Intune deployment by a couple of weeks in order to register the masses into the new system and avoid having to have users re-register their devices later this year. Do i have do deploy Agents before decommision of source hierarchy ? I have migrated all objects to new 1511 site, and before i deploy Agents i would like to upgrade this new site to 1602. Yes you should deploy the agents before decommision your previous hierarchy. That way, you will not have “down time” to manage your clients with SCCM. Hi guys, great guide. Have you had a chance to do you guide on the backup and restore option? I’m considering this at the moment as it seems like its the quicker way. We have SQL 2008 R2 on W2K8R2 for DB (separate server) and SCCM 2012 R2 on W2K8R2 – considering whether to upgrade to SQL 2012/2014 first, then run 1511 upgrade and then do the site restore onto a new SCCM 1511 VM (same name) and SQL 2012/2014 VM. Any advantage to doing the 1511 upgrade following the restore to the new hardware? I normally perform the backup/restore (to new OS) first. In-place upgrade to CM1511 and after that upgrade SQL. First of all thank you for the effort you guys put into this site, it is awesome! 1. Can i migrate my production R2 SP1 envirnoment to a test environment VM with CB (1511) installed? 2. How will this affect my existing environment? 3. After Migration is complete, will my old SCCM 2012 R2 SP1 still work the same? 4. So when i am finally ready to perform New Server installation and configuration for my Production, would i be able to create another migration job (this time from old to new production)? 2) no effect on your current. watch for boundary overlapping, AD discovery and client push to keep environment side by side. 4) yes, migration jobs are created on the new server to pull the information from your current environment. Thank you so much! Will help for sure! Thank you for the post, very helpful. Maybe you could point me in the right direction, after migration my deployed applications are not showing up in the catalog or software center. I tried redeploying to user and computer collections, modifying original collections, even deleting and recreating collections but deployments never show up. I’ve checked the colleval.log for anything but I see collections updating on schedule. Maybe this post could help you? Thanks for the reply but my issue is not really a problem with how to deploy apps and packages. I think that I have narrowed down my issue and found a resolution or at least a work around. But I do not have a root cause. 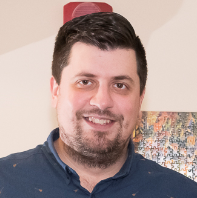 Issue: Group objects imported from AD and added as members to a collection are not receiving deployments after migration. Solution: Created query rule to add all users that are members of the group to the collection. This is likely a dumb question but I have followed your steps and have my new 1511 server just about 100% ready to rock. I was able to migrate about 90% of my objects and then had to manually recreate my task sequences. The only issue is that the migration jobs did not actually transfer my source content to my new server. If I look at the properties/source of an application I can see the source is still set to my old dp. 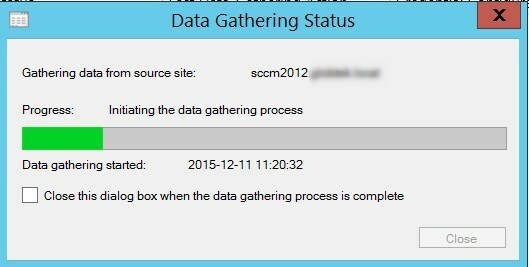 How can I migrate this data so I can take the old SCCM server off-line? Do I need to robocopy that data over and remap all of my objects to this new location? I’m in the same situation as Brian. I followed your guide (paid version) for installing SQL 2014 and SCCM 1511 and have done the migration, but original SCCM installation is showing as not Eligible for Reassignment. It’s currently hosting 49 migrated packages (according to Source Hierarchy -> Shared Distribution Points tab). Can you advise? Thanks. 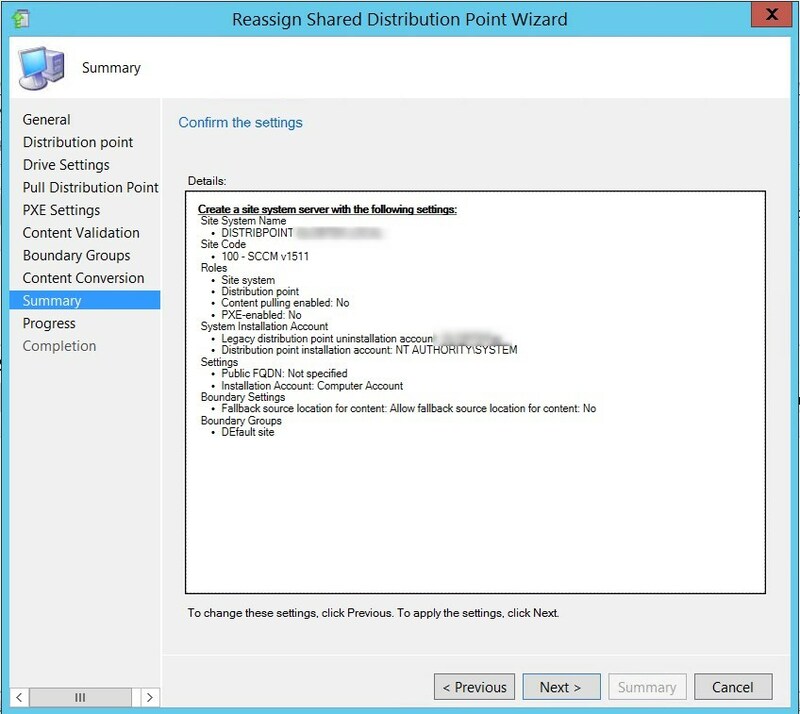 In other word, a primary server DP with SCCM 2012 is NOT eligible for reassignment. 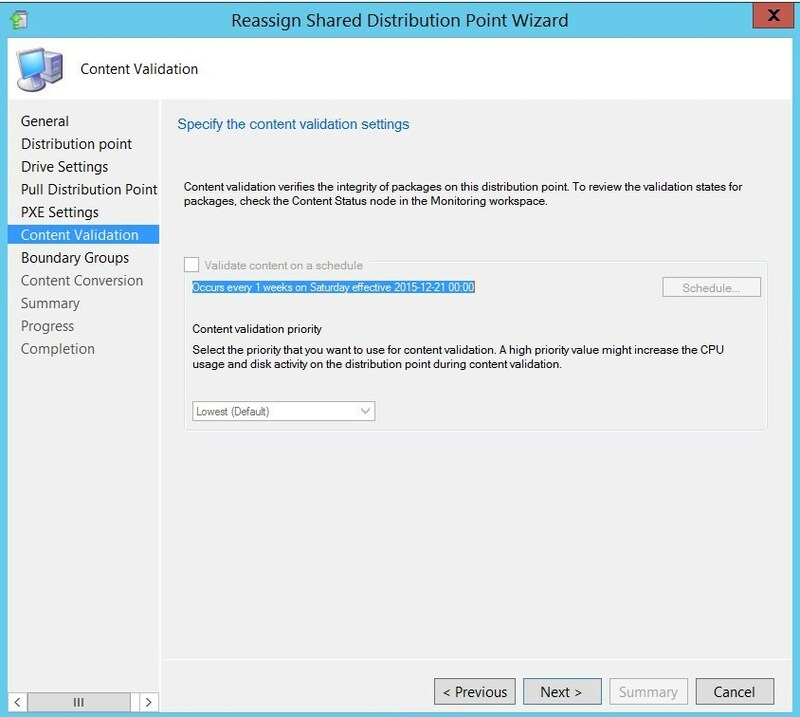 If you don’t have any remote distribution point, you will need to distribute the content to the new Distribution point under your primary server of v1511. So I can just use the tool that you specified for Brian to transfer the packages to my new 1511 installation and update the location in each package, and not worry about the shared distribution? All my drivers and driver packages are still shown as being located on my old SCCM server; I’ve always used a URL path. If you want to prevent this scenario in the future, I suggest that you move the content sources to a neutral server(file server) instead of the local SCCM server with shares on it. If you had this, it would have work directly without intervention on the v1511 for your packages. Thanks Jonathan. That’s a really good point about storing the packages on a neutral file server; I don’t know why that didn’t occur to me. I guess I could also take it one stage further and use a DFS Namespace, unless true UNC paths have to be used? Anyway, thanks so much for taking the time to reply to my questions; much appreciated. I manually copied my source content and then found this little beauty today which worked beautifully to update my source entries for applications. Just update the variables below for your new site server, site code, old content path, and new path. Run the script in verification mode first to make sure the new path is what you expect and then run it live. I was then able to run a test app deployment to a client on the new environment and all went well. Now if I can find something like this for my drivers I should be all set. Coretech is always providing useful tools ! 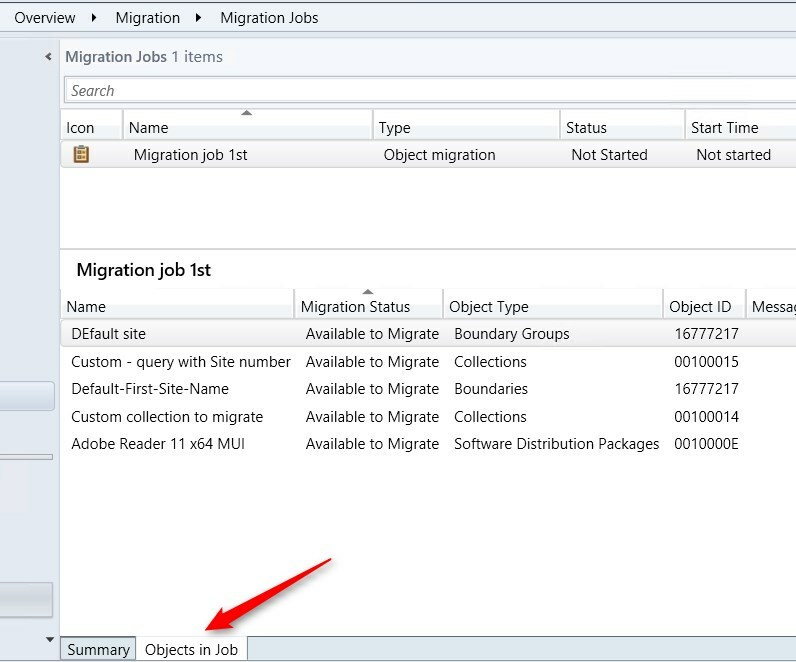 the actual content of the package is NOT migrated by migration task. Best practice since 2012 is around is to always use network path for source content for any packages/apps/OS/driver/etc. Some of them are mandatory to use network path. – Copy the content to the same local path on the new server, then update package so the content is distributed to DP. As for you Task sequence, not sure why you needed to recreate it. Thanks for your guide. I prefer the Option1 backup/restore. Because I want to have the new Windows 2012 R2 and SQL 2014 SP1. I think the option 1 the easy way to do that. Do you any guide for option 1? We are in the process of creating this guide. Please note that changing the SQL version between the backup and restore is not supported. The migration side-by-side is able to respond to this need. Thanks for your replay. Ok I will do an migaration. Tell me please should I install first on the new Hardware the complett Installation of sccm1511 with Configuration for example your guide part 1-22? I have at the time sccm 2012 R2 SP1 runing an all the sccm client 2012 R2 is installed on my workstaions and Servers. Should I uninstall the sccm client 2012R2 from my Workstation and server first and then install the new sccm1511 or it will be upgraded if I push the new sccm1511 client? I have a problem with the new fresh installation of sccm 1511. Thanks for the great post! A quick question on setting up source hierarchy. We have 1 CAS and 2 Primary site servers. Total number of clients are less than 20,000. Hence thinking to get rid of the CAS and have only 2 primary sites in future design. If we need to achieve this scenario, do we need to migrate jobs under Primary sites? Can you please put some more if my understanding is correct? As for the specific question, always use the top site for the source hierarchy. In your case, the CAS! 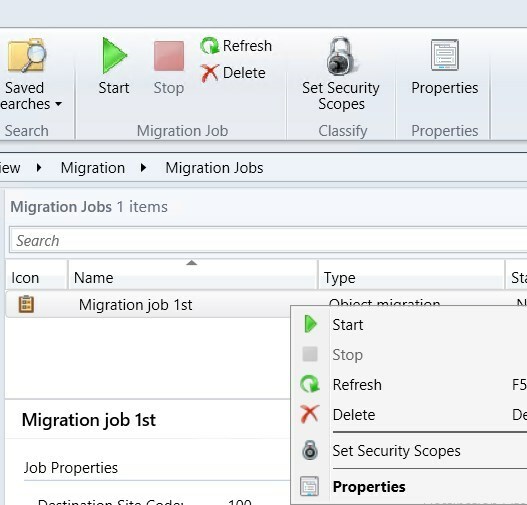 From technet : When you configure a migration job to migrate data from a source hierarchy that runs System Center 2012 Configuration Manager or later, you only need to specify the top-level site. I have a question if wsus is on separate box which is 2012 .DO we still need to upgrade site servers to 2012 for future support and servicing windows 10. I think that you would only need to install the required KB for WSUS 4.0 in order to support Windows 10 servicing on your 2012 server for Software Update. Your blog is so vastly superior to Microsoft’s documentation or lack thereof. Thank you for translating all this for the noobs like me. “Option 1: Install a new server with new SQL and use backup/retore function before upgrading to 1511”. Could you please elaborate on how to do this option 1? Option 2 is pretty daunting and I was hoping option 1 might be easier. I’ve never done anything like this, thanks. – Install SQL, if it was local. Must be the same version of SQL as before. It is unsupported to change SQL version for backup/restore. We are working on a guide to support this scenario. We only have a couple packages and barely use SCCM for anything. Instead of going through this complex migration process…can I just spin up a new SCCM 1511 server with a new site code and install the new-site-code-client on my workstations and servers? Then remove the old SCCM2012R2 server from service? I don’t care about old data or queries or packages or anything. As I said we barely used sccm for anything so I don’t care if I have to remake from scratch all my packages, settings, etc. I’m just curious if this is possible and how would I go about retiring the old server? Any active directory cleanup that needs to be done? Hope this makes sense. One forest, one domain, I don’t want to screw anything up too badly, thanks. 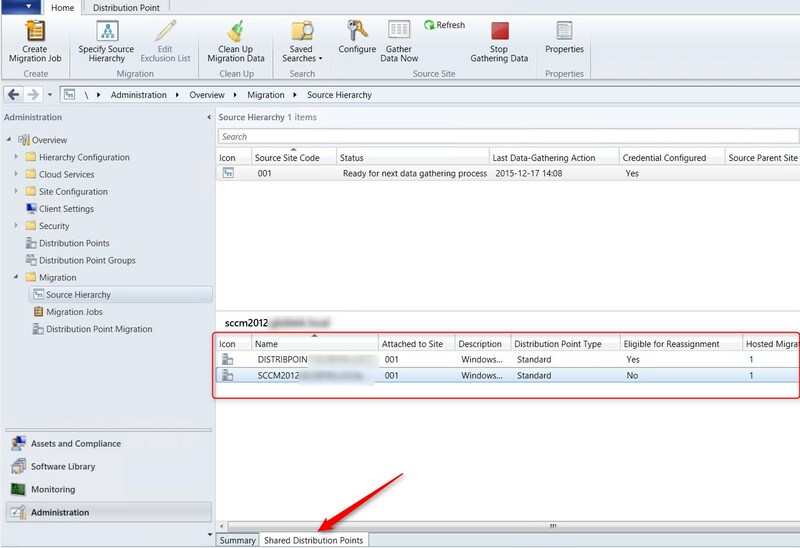 Great post, but any questions about this migration, if i have mobiles devices connected to SCCM 2012 with Intune in Hybrid Mode, how can i migrate this to the new 1511 Infrastructure ? Bump for this, this is a big question for me and my company. I’ve spent a great deal of time trying to find a definitive answer to this without luck. I did find this, but its over a year old now.